This hilarious, tongue-in-cheek guide from kid-expert Max reveals everything you need to know about the game of soccer. Max knows a lot about soccer. After all, he's been playing it for almost three weeks! So he's pretty much an expert. Here Max shares his one-of-a-kind helpful tips including how to warm up (stretch, twirl, somersault), who's who on the field (the ref is in yellow and wears a whistle--you should not bring your own whistle), and what to do with your hands since you can't touch the ball (wave at fans, hide them in your shirt, play itsy-bitsy spider). But could Max possibly be forgetting something very important? 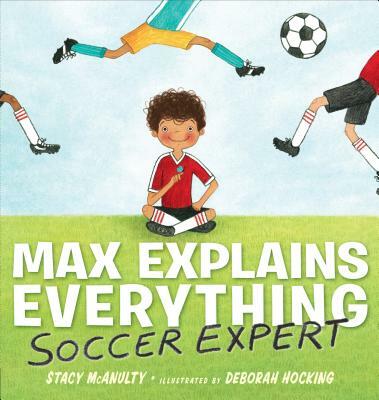 Full of humor, energy, and warmth, Max Explains Everything: Soccer Expert is the perfect read aloud for novice players as well as for fellow "kid experts" on the game. Want more fun with Max? Don't miss Max Explains Everything: Grocery Store Expert. Stacy McAnulty is the author of many children's books, including Earth! My First 4.54 Billion Years, Beautiful, Excellent Ed (an Ezra Jack Keats Honor Book), and 101 Reasons Why I'm Not Taking a Bath. She also writes chapter books and middle-grade novels. She lives in North Carolina with three kids, three dogs, and one husband. You can visit her at stacymcanulty.com or on Twitter @stacymcanulty. Deborah Hocking is the illustrator of The Great Henry Hopendower and the nonfiction picture book Build, Beaver, Build! Life at the Longest Beaver Dam. She lives in Portland, Oregon, in a hundred-year-old cottage that she fixed up with her husband, Jay. Learn more at deborahhockingillustration.com.